The Dollhouse Store. Cute ideas are available for your Dollhouse today. Welcome to your Dollhouse Store! In your Dollhouse Store, At-the-Doll-House.com, there are many treasures just waiting to be discovered by you. Miniature crafts are a part of this amazing line up. If it can be crafted into something for a doll's house it will be listed here. I am always updating the inventory displayed here too. If I think it's a great deal and very appropriate for you as an enthusiast/collector then I will place it on my store pages. If you discover something you wish was listed, send me a personal email, addressed to Lois, and I will list your item. I realize you want an awesome deal whenever you can get it so that's what I try to provide. No - Wasting - Time - Click - Above - to - Enter - Now ! Clicking on any picture above will take you to that item category. * The Toy Shoppe's main navigation can be found directly above in the house layout consisting of various product examples. * Search for anything you desire in the search box at the beginning of your store. * To view our Dollhouse Store's FULL DETAILS check out the info listed directly below this block of products. * More Shopping Categories listed on various pages when appropriate to the subject. We only list Doll House relevant appropriate items for collecting or for play. All products listed are thoughtfully picked for you. Category titles that appear in the search box above are search-able. You can also enter your own keywords at your convenience. As we find new and relevant products you will find them listed. Want a particular dollhouse store item listed? Contact us here. Most of the Barbie Doll Houses listed come with 5-Star recommendations from other shoppers. If you are logged into Amazon, as well as being on our site, your own Wish List may appear. You can always 'delete' any item you have changed your mind concerning. Discover inspiring mini polymer clay craft ideas for your miniature creations. 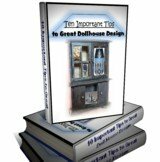 Find a dollshouse and add it to your Amazon wish list. Purchase that "just right", "so special" doll's house. Seek out your favorite online miniatures any time day or night. Look for the perfect miniatures gifts for the collectors you know. Buy special paper crafts for your private creations. Plus you will be able to do all this without the usual shop 'til you drop syndrome of tired, aching feet. Yes, all from the comfort of your computer, laptop or any other device you may use. I love doll house crafts of any style or design. Every time I find more items it's hard NOT to buy them all myself. The dollhouse store is truly the best of both worlds. Here you get to dream and shop at the same time. Personally I do a lot of my purchasing online these days as do many others. Online it seems to end the time consumption you find in offline stores. Whenever you want a miniatures instruction books in particular it is super easy to go to our Toy Shoppe Online and enter a few keywords and see the tremendous offerings at your fingertips. Not so offline. Yes it's an ever growing display of dollhouses, accessories, supplies, tools and great finds. Your Toy Shoppe is made with you in mind. Everyone who passes through these pages is welcome. So come on in, make yourself to home and get acquainted with our great bargains. Look on these pages for products dealing with these items.